A hidden past is a bedeviled path that presents a potent danger to a man that walks it. 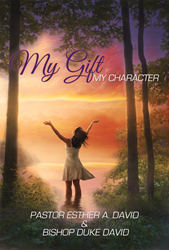 Within the pages of Pastor Esther A. David and Bishop Duke David's new book, My Gift, My Character, ($15.99, paperback, 9781545600566; $7.99, e-book, 9781545600573) readers will find the information they need to take sustained action in issues that intrude on their existence. The authors hope that, by being informed, readers can source for solutions using biblical principles. "God created a good thing when He created the man-but the man created his own mess. The man's seed is disadvantaged for lack of knowledge. This book provides uncommon solutions to man's common problems," state the authors. "A hidden past is a bedeviled path that presents a potent danger to a man that walks it. This book remains newsworthy because it is a compendium of sacred truth." Pastor Esther A. David and Bishop Duke David have over twenty years of experience in pastoring over and mentoring the household of God. Together they pioneered Rockwater Church in 2006. Pastor Esther A. David holds a B.S. from F.I.T. SUNY and certificates in Christian studies and counseling. Bishop Duke David holds a B.S. in Business Administration and an MBA. Xulon Press, a division of Salem Media Group, is the world's largest Christian self-publisher, with more than 12,000 titles published to date. Retailers may order My Gift, My Character through Ingram Book Company and/or Spring Arbor Book Distributors. The book is available online through xulonpress.com/bookstore, amazon.com, and barnesandnoble.com.